Since the age of 12, Rafael Ramirez Máro has worked as an official collaborator in the studio of his father, the painter Antonio Máro. With him he realized many works for biennials (Venice / Sao Paolo etc.) and for important art fairs as well as public works for city halls (Hilden (2 × 6 meter oil painting) / Meinerzhagen (6 × 18 meter oil painting)), chapels (Salzburg A./Buchet D.). He studied under Hannelore Köhler at the Academy of Düsseldorf, at the “Escuela Superior de Pintura St. Luc” in Liège, under Prof. Schaffmeister and Prof. Koller in Cologne and at the RWTH Aachen. His subjects were art history, philosophy and German philology in order to deepen his understanding in the great literary picture cycles. He analyzed the old masters like Rubens, Van Dyck, Velázquez etc. in the great museums of the world. He is a member of the Fundación Arte y Autores Contemporáneos in Madrid. 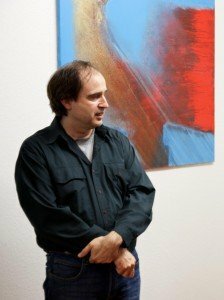 Numerous exhibitions and portraits in Germany, Belgium, the Netherlands, Spain, Austria, Italy, France, Switzerland, the USA and Perú accompany his artistic career as well as participations in many important art fairs and collective exhibitions. Rafael Ramirez’s abstract spectrum, ranging from the purely abstract to the rich classical repertoire, allows him to let basic approaches of classical elements appear and disappear on one time or another. His paintings are an astonishment of the world of art and one feels his love for it. He does not select art like in todays usual meticulous practice in courting and rejecting, nor does he classify it as “in and out.” His works reflect classical and modern painting without denying the handwriting of an inspired and master painter. Since his 12th year, Rafael Ramirez has been working continuously in the paternal studio and soon became an irreplaceable aid to Antonio Máro’s large public projects. The highlight of this team of father and son was the co-operation of the 17-year-old at the then largest oil painting of the 20th century, 6m x 20m on canvas in Meinerzhagen. Years later the painting of a chapel near Salzburg followed. Ramirez soon went to the largest museums in the world, where he studied the old masters. His father could not teach him anything about these works. The painter Rafael Ramirez is an artist for humanity. He is a limitless fine man. A conversation with him is always associated with joy and happiness. He respects his parents, takes care of his siblings, observes his surroundings, he is just always present when being addressed to and always ready to help. Accordingly, his artistic activity as a violinist, pianist and, above all, as a painter, is known to the public . His themes are world themes. He holds “his” people against the light, lets them live, gives them dynamism, shows their smallest and finest impulses, puts them in a poignant atmosphere. In his pictures one experiences the suffering in Auschwitz, the madness of the human being Don Quixote, Despair of a Woyzeck, death in the Requiem of Mozart, the demonic possession of a Don Juan, the openness and trustworthiness of Martin Buber. To paint the human being, showing him in his fundamental and undeveloped depth is his thematic, formal and coloristic concern. He is working restlessly, in order to realize the meeting with “his” people.